This message was among the graffiti left by three teenagers Thursday night at Fort Revere Park in Hull, police said. Three teenagers from West Bridgewater were arrested for allegedly spray painting graffiti on a wall at Fort Revere Park in Hull Thursday night, police said. Jacob Looney, Emma Pimental, and Emily Rose, all 18 years old, were charged with malicious destruction of property, Hull police said in a statement Friday. A Hull police officer and a state trooper responded to a report shortly before 8 p.m. that people were seen “tagging” at the historic park. The two officers found the teenagers holding cans of spray paint, according to the statement. 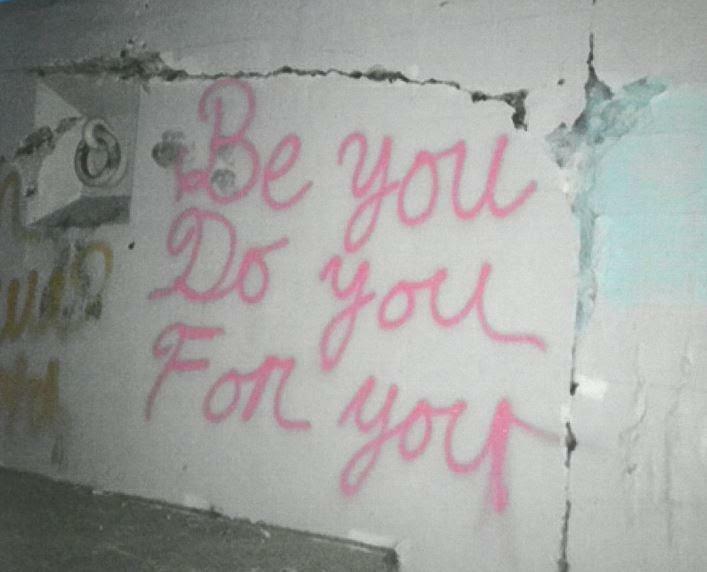 A photo released by police shows the phrase “Be you Do you For you” spray-painted in pink. Police did not say what other words or images the teens allegedly spray-painted, but “there was nothing hateful,” said Chelsea Belliveau, a Hull police spokeswoman. The teenagers were each released on $40 cash bail, “pending their arraignment in Hingham District Court,” the statement said. Jacob Carozza can be reached at jacob.carozza@globe.com.